Located in Southern Poland's Silesian voivodeship, the 14th-15th century Mirow Castle is but a ruin. However, you can still walk the castle grounds and get an idea of the size and stature of this once-impressive medieval structure. Reszel Castle was originally built in the 14th century, but you can still stay in this hotel, eat at its restaurant, and visit its art exhibits. Visit the Reszel Castle website for details. The Moszna Castle Hotel is housed in what used to be the 17th century residence of the German Tiele-Winckler family. The castle boasts 365 rooms and 99 turrets! The original Olsztyn Castle is another remnant of Casimir the Great's 14th century reign. All that remains of that Olsztyn castle is ruins. However, the town of Olsztyn boasts a recent version of the castle. The new Olsztyn Castle is now a museum, which offers a hands-on approach to learning about life in the castle. Learn more about the museum at its website. Information on Raciazek Castle is difficult to find - this 14th century castle once belong to bishops - however, if you're in the area, you'll still want to explore these interesting castle ruins. Built in the 17-18th centuries, Rogalin palace began as a Baroque structure. Over the centuries, its style has been adapted to suit the times. The Rogalin Palace is part of the National Museum of Poznan, and has been awarded a grant in order to restore and preserve it and its treasures. The Rogalin Palace is surrounded by park grounds. The Wawel Royal Castle is located in Krakow and is one of its most popular attractions. Wawel Cathedral is a part of the Wawel Castle grounds and is where many important Polish rulers are buries. Some of Poland's great art treasures are held within the Wawel Royal Castle museum. Wilanow Palace is located in Warsaw. Constructed in the 17th century, it was built by an Italian architect with Versailles as his inspiration. The Wlanow Palace was made into a museum in the 19th century, but was privately owned. It has been owned and run by the state since the middle of the 20th century. The Presidential Palace of Poland, located in Warsaw, has been the seat of the President of the Republic of Poland since 1994. Originally built in the 17th century, the palace served as private residence to a series of noble families. 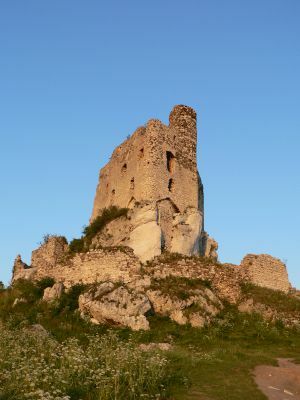 Ogrodzieniec Castle is an example of well-preserved medieval castle ruins. Located near Krakow, Ogrodzieniec Castle is open to visitors from April to October. Radzyn Castle, located in Radzyn Chelminski, was a Teutonic Knights' castle. Its red brick walls and size make it reminiscent of Malbork Castle, another Teutonic structure, but Radzyn is not as well preserved as Malbork is. Czocha Castle, is located in the southwest part of Poland, in Lesna. Though Czocha Castle was renovated many times over the centuries, it maintains its historic charm in the form of a hotel. Sandomierz is one of Poland's oldest towns and was once a significant trading post. The castle in Sandomierz is only one example of the town's historic buildings. Chojnik Castle was built on a hill near Jelenia Gora, in the southwestern part of Poland, now a part of a national park. Chojnik Castle is a tourist-friendly attraction with an onsite restaurant and hotel. Krzyztopor Castle is an enormous 17th century ruined castle complex in the southern part of Poland. Difficult to get to for tourists, the site is nonetheless beautiful and impressive if you can find your way there. Today, medieval tournaments are held on the castle grounds.